These were the most searched home trends of 2018 - and there are a few surprises. Just like in fashion, the hot trends in home and decor come and go. In 2016 and 2017 we had the millennial pink trend and let's not forget the copper and rose gold accents trend. Certainly, 2018 was a big year for new home decor trends. Cool tones were replaced by earthy hues and mid-century modern decor began to worm it's way back onto shelves. With lots of new and different trends growing in popularity, the realm of home decor is more diverse and unique than ever. To give us some insight into the changing tastes and new trends in the home category, Pinterest released its annual report on the top homewares searches 2018. Home decor lovers should keep their eyes peeled for these trends because many of them will carry on into 2019. From boho brands to mid-century modern, Scroll through to see what was hot in home in 2018, and what trends we're expecting to see a whole lot more of. Wicker easily had to be one of the biggest and best homeware trends of 2018. Whether you were after the beachy vibe or enjoyed the boho look, this trend fit into a number of homes quite seamlessly. That's why it comes as no surprise to see it as a hot home trend from the last year. The Pinterest search of "rattan furniture" increased by 540% in Australia compared to 2017, showing we aren't the only ones obsessed with the 70s trend. Another personal favourite of our own had to be statement rugs. Think bold colours and boho as two of the main favourites from the past year. There was a huge demand for this homewares trend over 2018 with the Pinterest search volume up 236% compared to last year. Blank walls became a thing of the past in 2018. This new homeware trend was a "go big or go home" kind of thing. The Pinterest search volume for "big wall art" was up a whopping 637% and you simply can't argue with that. There isn't a distinction on the type of art people were enjoying in 2018, more that they'd simply had enough of their plain old walls, although we have been seeing lots of popular prints such as leaves and marble paintings. This was not only a popular homeware trend of 2018 but it's a slightly more affordable option too; hence why we think it may have increased in popularity so significantly. Cement tiles give your home the look of stone tiles but for a significantly cheaper price and that's something we can all appreciate. So it really isn't a surprise that the search volume on Pinterest for "cement tiles" went up 262%. Without a doubt, this is another personal favourite of ours. We've seen a number of metals become homeware trends like brass, copper and of course, rose gold. In 2018 the rule book went out the window with the homewares trend of mixed metals. Pinterest reported that the search volume of "mixed metals" rose by 423% and we wouldn't be shocked if that number continued to grow. 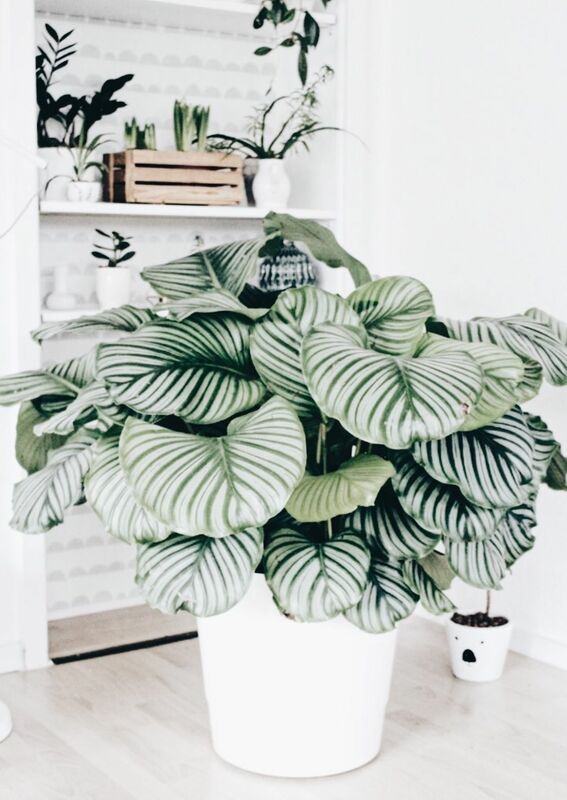 Plants have always been a household must-have. But in 2018 patterned plants gave that little something extra to an abundance of homes and we were living for it. The multiple shades of green and bold textures give your living space depth, hence making it a hot 2018 trend. This home decor became so popular over the last 12 months that the search volume grew by a staggering 553% on Pinterest. Fringe was once a style reserved for fashion and accessories. Now the trend has found its way into homewares and it's popular as hell. We're seeing fringe lamps, cushions, rugs and even tables and we're enjoying how funky these look in homes. Fringed throw pillows were one of Pinterest's initial trend predictions for 2018, and they were definitely on the money. Now fringed furniture is up by 275%, including everything from fringed chandeliers to fringed sofas. Everyone loves their home to have that touch of uniqueness. Geometric accents give that special look to a home in a number of soft styles that aren't too harsh. This trend was a big one during 2018 with geometric accent tables up 536% and geometric tiles up 238% on Pinterest. You can also expect to see this trend growing out into other home aspects such as wallpaper and bedding. 2017 saw the huge homeware colour of millennial pink but the shade was well and truly used and abused. Thankfully a new hue took the centre stage with red shades being an incredibly popular home decor colour for 2018. The shade gives a rich Australiana vibe to a household with red hues growing 217% on Pinterest, followed by pins for hunter green which increased by 209% and dark blue which grew by 139%. The industrial style is shaping up to be one of the hottest decor trends of the year. Here's how to get it. Make everything old new again and give your home a style makeover with this retro trend.